As some of you might know, we went away for a few days last week. While exploring the town of Lincoln one day, we found one of our favourite stationery shops, Paperchase! At the very front of the store, the new ‘Purr Maids’ range was displayed and the bright colours and cute kittens really drew us in! It is actually blogger’s paradise in there and the new collection will have every blogger falling in love! 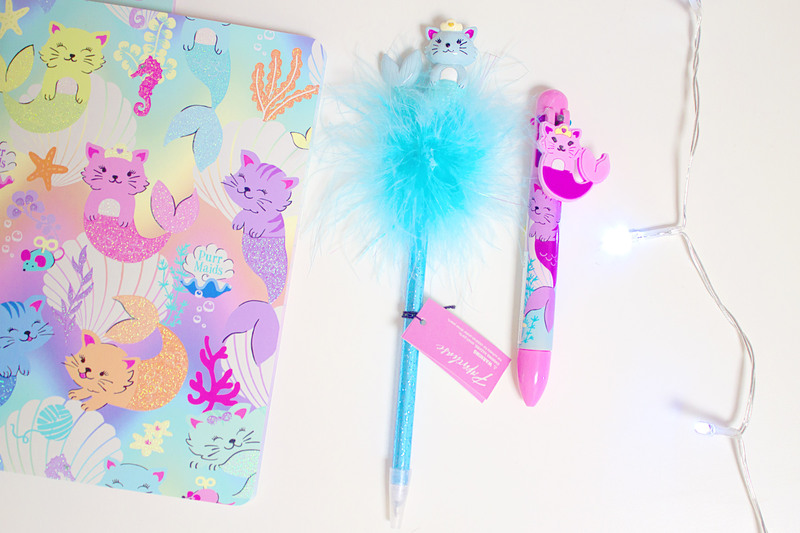 It’s safe to say we were totally captured by the pastel colours and what could be cuter than cats as mermaids?! We had to pick up some stuff and we thought it would be great to show you what we got! 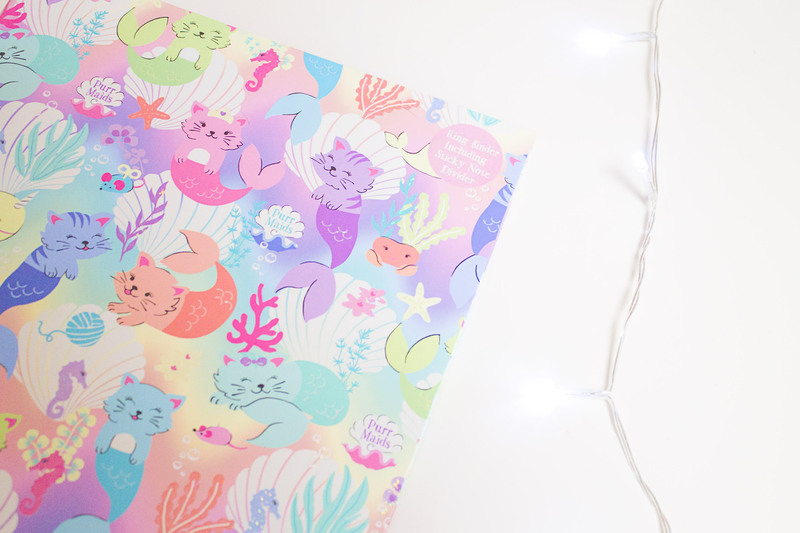 How adorable are these A5 exercise books?! I (Lauren) probably didn’t need these to be completely honest but I jut couldn’t resist. They work out at £2.50 per notebook which is a huge bargain for me! I was also so happy to see that the pages aren’t just plain and that they in fact have rainbow pages with cats on them. What’s better than that?! The designs are amazing too, they’re so bright and cute. I may brave it and take these to uni to write my notes in, if not they’ll come in handy to pop all our blog ideas in! These pens were just too cute not to take home with us! Lauren picked up the adorable fluffy pen, which reminded us of our childhood (who didn’t love these pens?!). The little mermaid cat on top just adds to the adorableness! This pen also came in orange so perhaps they sell it in a variety of colours?! Although at the time of writing this we were unable to find it online, so if anybody knows please let us know! Rachel bought the multi pen (also reminding us of our younger days… maybe the range is actually targeted towards children. 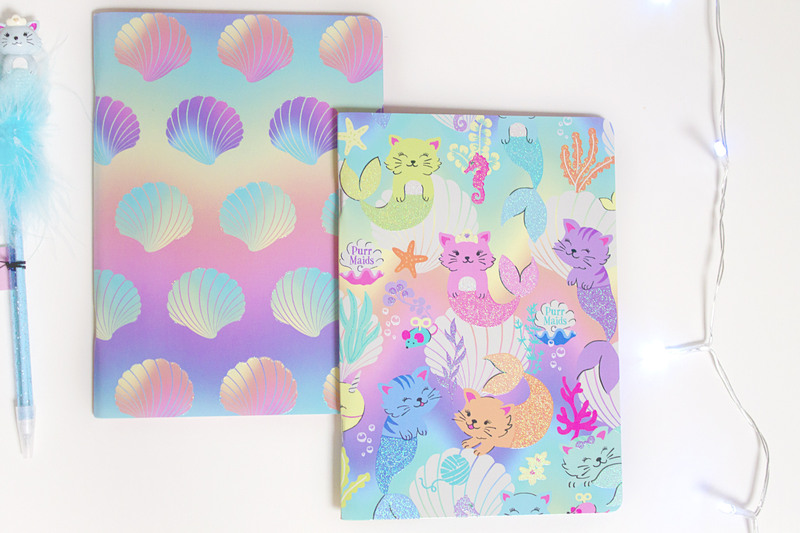 Oops) which has an adorable little rubber mermaid cat on it! The prices of both weren’t too bad and they’ll also look adorable as blog props! 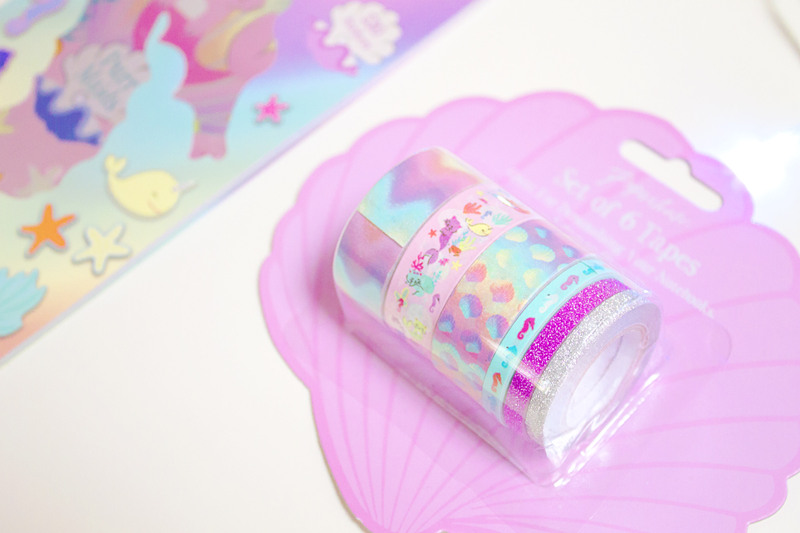 We were so surprised when we found these adorable washi tapes in the range! I (Rachel) picked some up straight away as I’m obsessed with washi tape at the moment. They are also perfect for decorating orders from my Etsy, the only problem is, I love them so much I don’t want them to run out! They were quite pricey but considering there are 5 different tapes, which are also very good quality, it isn’t as bad as it sounds! 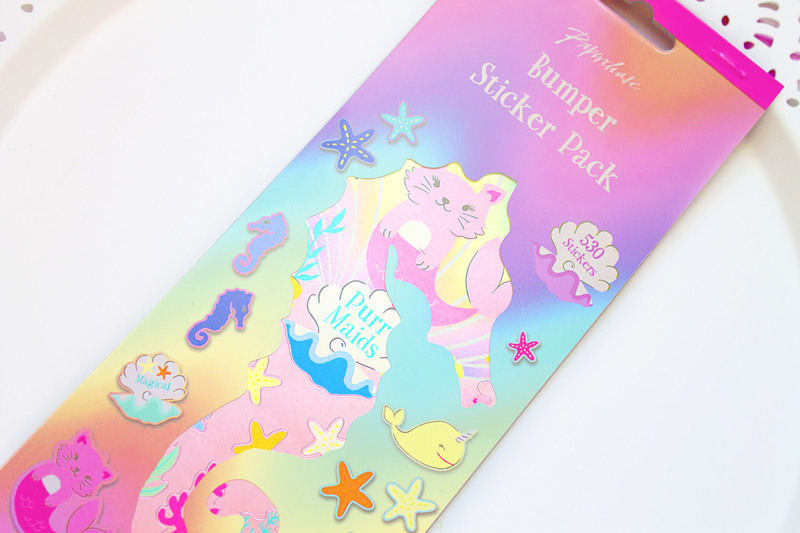 I wouldn’t normally buy stickers, despite how cute these ones are, just because I wouldn’t really use them! But again, I got these for decorating envelopes for my shop and they make them look so lovely! The book has 530 stickers, which I don’t think is too bad for £4. At least I know I’ll get good use out of them too! 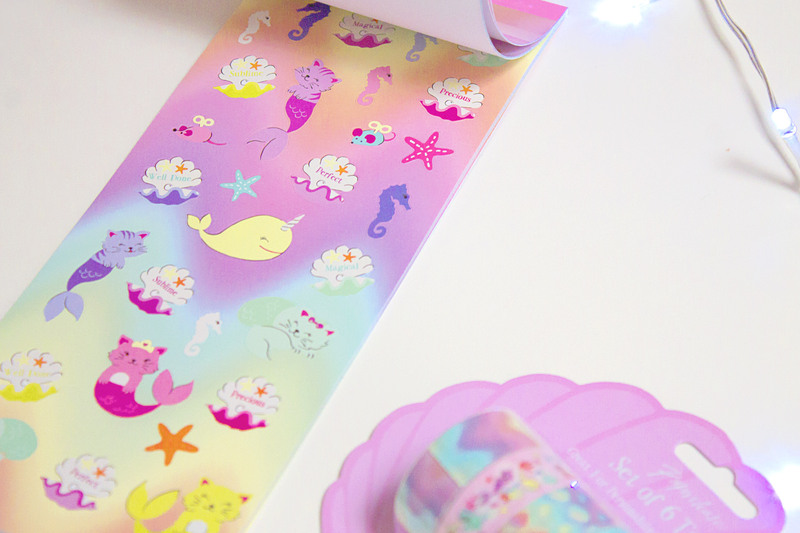 There are loads of cute stickers in the book including little purr maids, whales, seahorses and starfish! So if you ever order a print from me look out for a few of these on your envelope!! Another thing I purchased for my shop is this ring binder. I wouldn’t usually spend £8 on a ring binder but I think the fact that it has extras inside made up for it! Not only that but the design is so lovely, just like everything in the collection. I am going to use this to put all of my prints inside and organise them. The to do list will be perfect for keeping my shop organised and the sticky notes will be great for writing little thank you notes! I also love the fact that it has stickers too, since I can use these up first before using my actual sticker book! That’s everything we got from the collection, but trust us there are so many more products available! We’re trying to budget ourselves and save money so this is all we could afford, although if we could we would’ve taken the whole collection home with us! 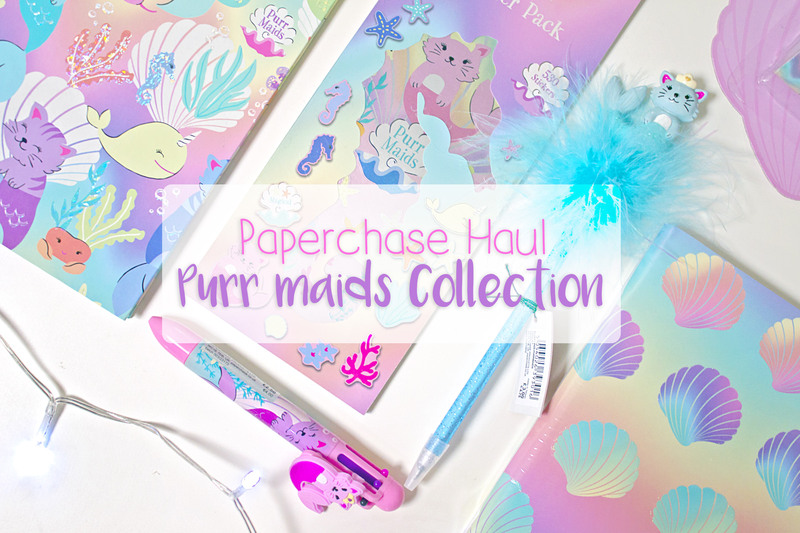 Have you bought anything from the Purr Maids range? Tell us in the comments what you got! 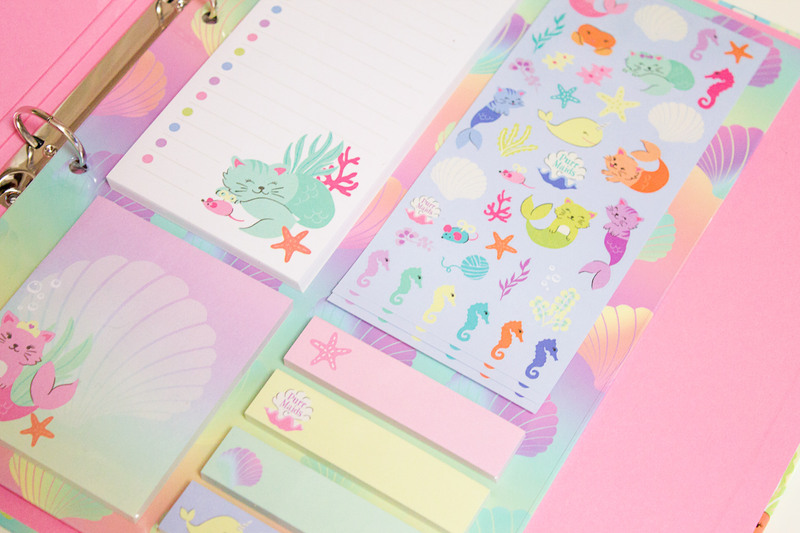 This is such a cute range, this would be perfect for my Uni stationary! I love this range. 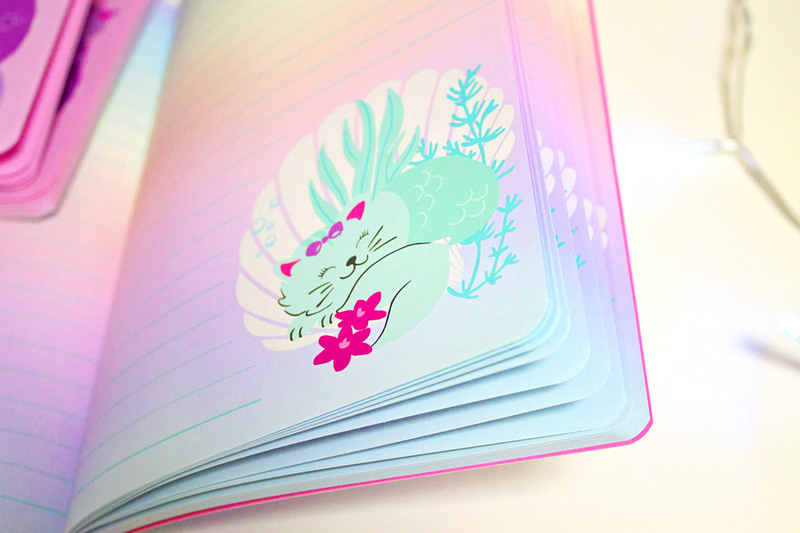 I might be placing another order tonight actually…I recently picked up the Purrmaids July to July diary. But I want more now I’ve seen this post! Haha. It’s all just so cute!